6 Steps to Make Sure Your Air Conditioner is Ready for Summer | Williams Service Co. Nothing is more frustrating during the hot summer months than living with an air conditioning unit that can’t keep up with demand. After all, working up a good sweat outside is great. Inside? Not so much. 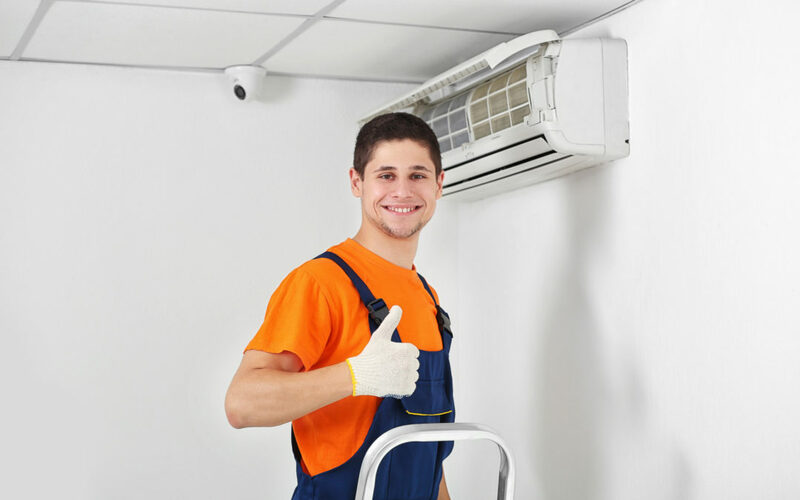 So how do you ensure that your summer air conditioning is ready for the work? There are a few simple things you can do to make sure that your unit is ready for summer. This way, when it comes time to finally turn the unit on after months of sitting idle, you’ll be greeted with cool air. Just follow these ac tips for summer and you’ll stay cool as long as you want! Air conditioning units have moving parts powered by electricity. You need to make sure you think of safety first and if there are things you are unsure about, you should contact a professional for help. Before working on any part of your unit, you need to turn the power off so you can avoid electrocution. You can turn the power off at the breaker box. Also, familiarize yourself with the condenser unit because there are capacitors that can hold a charge for close to an hour. Once you have the power off and understand the parts of the air conditioning you will be working with, you can start preparing for the upcoming season. There are several things you should do on a regular basis to ensure that your unit works properly and efficiently. Some things should be done every month or so while others can stand to be done once a year. Let’s start with something easy that should be done regularly: replacing your air conditioning filters. The filters are located in the large vents either on a wall or on the ceiling. This is where the air enters the unit so it can be cooled. If the filters are clogs with dust and dander, then your unit will not be efficient, costing you money and forcing you to deal with warmer air. To change a filter, all you have to do is open the vent and remove it. The size will be printed on the cardboard frame. There is a large market for air filters, some better than others, so you can do a little research and decide which filters you want to buy. Replace the filters at least twice a year. The condenser is the large unit that sits outside your home. This is where the heat exchange takes place to coll the air that reenters you home. If this unit is not cared for, your air conditioning will not be as efficient as it could be and could lead to bigger problems. Make sure that there are no plants growing close to the condenser and move any leaves or other yard debris gathered near it. The condenser needs to have great airflow to work. You can also pressure wash the screens that are covering the condenser. Just like the filters inside your home, if these are clogged, the airflow will be constructed, forcing your unit to work harder. Soap and water will usually do the trick, but you can also buy special cleaning fluid that will break down stuck-on gunk. After you clear the area around the condenser, look for any loose bolts that can be tightened. You can also remove the cage and clean the fan blades as well as adding a little lubricant to the ports for smooth operation. The thermostat is what tells your air conditioning unit to turn on and off. If your thermostat is old, out of date, or broken, you will have a tough time maintaining the temperature you want once the weather heats up. You can tell if your thermostat isn’t working correctly because you will see large temperature swings throughout the day. This means that the sensor is off and, while the unit will still work, you won’t ever be able to get super comfortable. Maybe your thermostat is just old. The dial-type thermostats that were popular a few decades ago are still around and it’s possible that it just isn’t up to date enough to handle the work anymore. The good news is that there are tons of thermostats out there that aren’t very expensive. You can get basic thermostats to “smart” ones that you can program and control from your computer and smartphone. The coolant lines run from the condenser unit outside to the wall of your house where they connect to the air handler. Check that these lines are in good working order to get ready for summer. The lines should be covered with an insulation that keeps the hot outside air away from the metal line. Replace any ripped or otherwise damaged insulation. This is an easy job to do and shouldn’t take long. You can find insulation sleeves or a foam that you can use at any hardware store. There are two things to check here. First, make sure all of your registers and returns are well ventilated. This means no rugs or furniture should be placed on or in front of them. Second, look at any exposed ductwork for cracks or holes. If the ductwork is in disrepair, then you won’t get the right amount of cool air where you want it. You can fix any small holes or cracks with duct tape. If you can, check where the ducts enter the unit itself as well. If there are too many holes or you don’t think you can handle the job on your own, contact a professional. Air conditioning units do a lot of work during the summer. If you don’t prepare it for the work ahead, then chances are, you’ll find yourself sweating with no relief in sight. Instead, stay on top of the little things and your air conditioning will be ready for summer. Please check out our blog or contact us anytime you have a question about your air conditioning unit.